My name is Kim Bongiorno. I am a freelance writer, blogger, essayist, author of a collection of short fiction stories, and have completed my first Young Adult fictional novel manuscript. 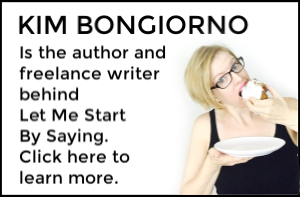 Let Me Start By Saying started as a place for me to write about finding the humor in a life that kept throwing lemons at my head while I worked toward my end goal of being a full-time freelance writer and novelist. It has received accolades from Babble, HuffPostParents, NickMom, and BlogHer, as well as earned me the titles 2013 BlogHer Voice of the Year (Inspiration) and Circle of Moms Top 25 Funny Mom of 2011 and 2012. You can see some of my most popular posts here. For blog stats, please contact me. My favorites are Facebook and Twitter. I have experience as a Social Media Manager for a popular women’s humor website. The Washington Post, NickMom, LifetimeMoms, The Huffington Post, In The Powder Room, Momtastic, Mamalode, iVillage, Today’s Mama, Nickelodeon ParentsConnect, Parents Magazine, QueenLatifah.com, PopSugar, EverydayFamily, ScaryMommy, The Good Men Project, Mommy Shorts, Rants from Mommyland, Bonbon Break, BlogHer, All4Women, The Mouthy Housewives, FitFusion, gDiapers, Centsless Deals, NinjaMom, and others. I wrote and designed 150+ short online ebooks on topics such as humor, health, parenting, children’s stories, and more for the start-up company Britely.com. Honored as a 2013 BlogHer Voice of the Year in the Inspiration category. Named on dozens of Best/Funniest Tweets of the Week lists by HuffPostParents, NickMom, Elizabeth St, and others. Listed as one of the “10 Funny Mom Bloggers You Should Read Today” on Babble (2012). Chosen as a “Best of the Mom and Dad Blogs This Week” on Huffington Post Parents (2012). Voted a Circle of Moms Top 25 Funny Mom in 2011 and 2012. I was on a panel of experts at the Speed Dating for Writers during the 2016 Erma Bombeck Writers’ Workshop. I consulted on social media. Readings, book signings, and other appearances, past and future, are on my Events page. In 2012, I created, launched, and wrote the holiday-season website ElfShaming.com.